If you’re looking for cute places to shoot in San Diego this one is for you! 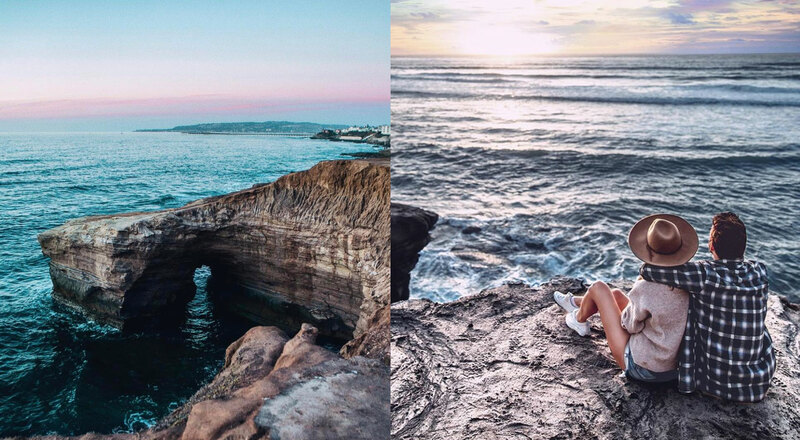 One awesome thing about San Diego is that there are plenty of options when it comes to cute locations to hang out in as well as great spots to shoot some killer Instagram worthy content. My first post INSTAGRAM WORTHY SPOTS IN SAN DIEGO is still relevant, but there are other amazing places to list and another post on the subject was much needed. So here’s a new list for 2019 of some amazing places you may want to check out in San Diego. Holy Matcha is the cutest little matcha shop with all things green tea from matcha lemonade to matcha chia seed pudding. 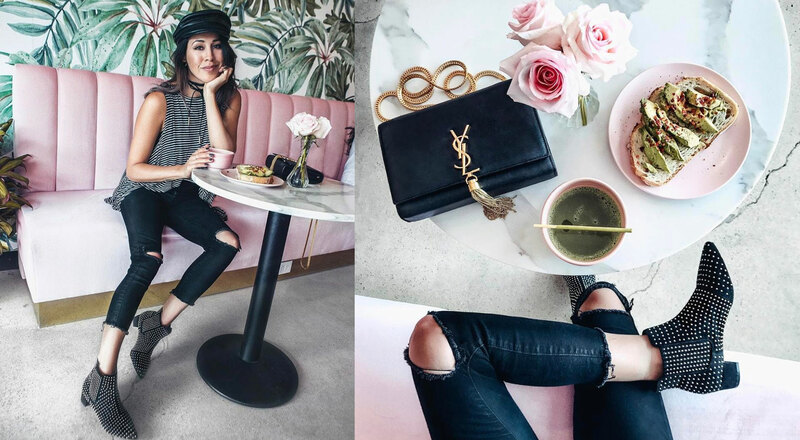 If you are a true matcha head, get the ceremonial 😉 Their pretty pink couches and leafy green wallpaper make it almost impossible not to snap one photo in there. El Camino is a really cool spot to grab some Mexican Grub and listen to music. If you just want a cool pic with a cool backdrop though, the outside is a good spot to shoot! They have murals around the building and an epic neon sign in the front. If you like night time photos, this is your spot. If you prefer day time shots, the walls made for a fun change in scenery. There’s one whole wall that is black and white which is always a fun shoot location. I’m sure you have seen plenty of photos of bloggers standing in front of the pink walls in La Valencia. This iconic Mediterranean style hotel sits overlooking the ocean in La Jolla. It’s really beautiful and great for some vacation inspired shots. My favorite is the tiled floors which you can find all the way on the bottom of the hotel by the pool. I love grabbing a glass of wine with some food on their outside terrace and then going to shoot a pic or two right after. Their brunch is also nice if you are willing to spend that La Jolla money. Definitely stop here if you are in the area. The Grounds Bean Bar is the cutest! Not too many people go here (as its more of an intimate coffee shop) so it makes shooting a picture less stressful. The wallpaper is super pleasant, the food is good (and pretty might I add), the plants are lush and the lighting is perfect. 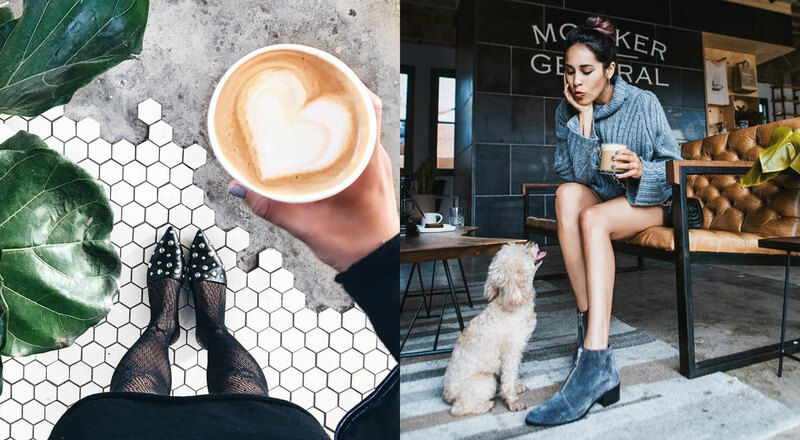 Definitely a perfect Instagrammable coffee shop that people will love to geotag. While this space is small, you do have a couple different options on where to snap a photo. Outside you will find some picnic tables and benches (with a dark wall behind), while inside you can either sit at the cute tables next to the window or hang out in this corner (against the tile that you see me sitting at below). I love Coffee and Tea (downtown) because not only do they have the best coffee (legit strong AF coffee), but they also have a beautiful little tile backsplash that I love with all the right blueish metallic industrial hues. 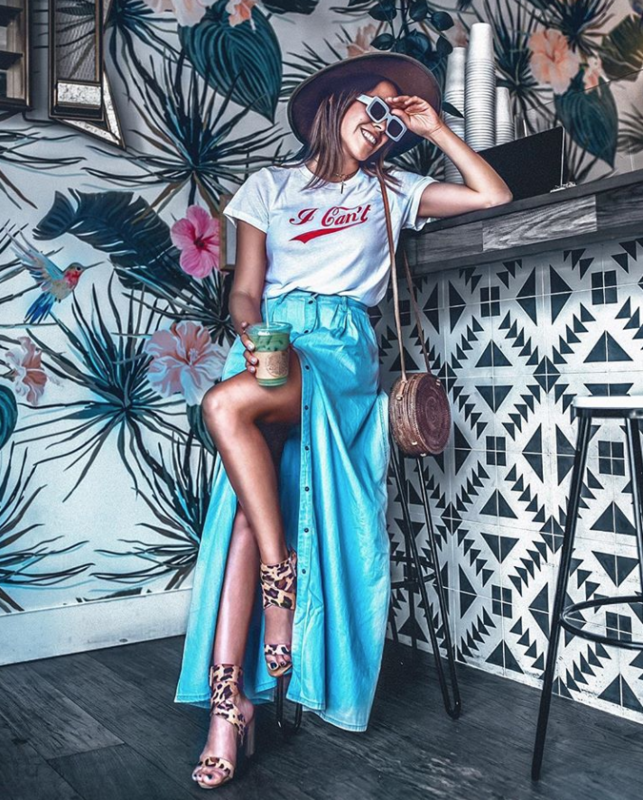 This place is super small, but if you get the right spot it’s perfect for a coffee shop pic. 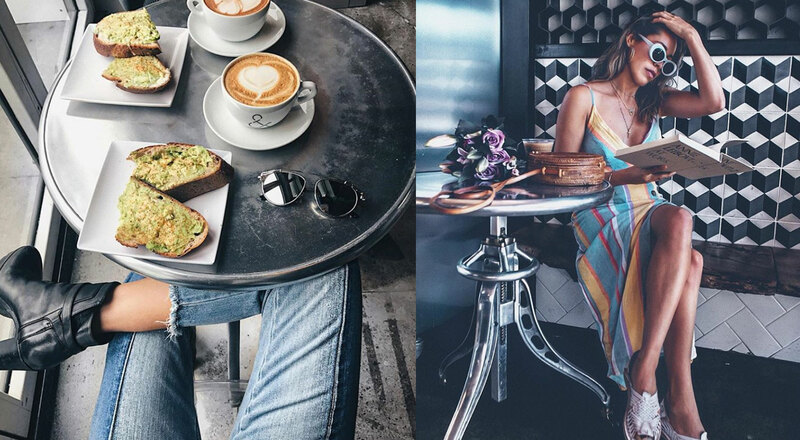 I’m always down for a latte and avocado toast from here. There’s also a yummy smoothie and juice shop right inside the same space called UNICO! So if you are feeling like you need more substance you can always grab a little something there as well. Balboa Park is pretty big so grab your walking shoes and explore! 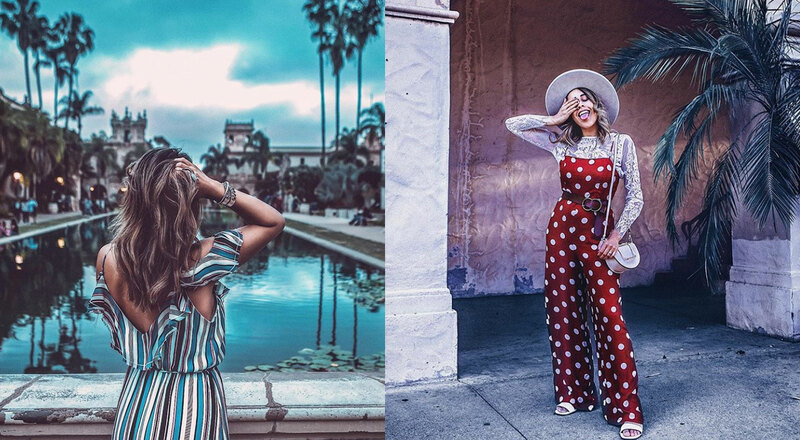 If you are from San Diego you already know about Balboa Park and how great it is for photoshoots! If you aren’t familiar, you may want to know that there are different areas to this park. There is a rose garden (only sometimes during the year), a cactus garden (huge cacti and small cacti everywhere), a botanical garden (this place is beautiful), gorgeous Spanish buildings, a Spanish village (that has so much color everywhere), a huge Koi pond and more. It’s really beautiful to just walk around and enjoy (check out all the museums this place has to offer), but especially amazing to snap a few photos. I have shot on the Suspension Bridge a few times and it always looks amazing. This is a hidden gem of San Diego that not EVERYONE knows about. It’s a bridge that is suspended very high over a San Diego canyon, but its super sturdy! If you go at golden hour, the shots will be perfect! There normally are other people shooting every single day so make sure to go with plenty of time so you can wait for the perfect shot without other people in it. You & Yours is a really great place to grab a drink in the East Village of Downtown, SD. The handcrafted cocktails are delicious and the place is beautiful. It’s super light and airy inside, big space with high ceilings and beautiful decor. I love the blue tiled bar and the velvet tufted sofas against the white subway tile wall. There’s also a more industrial looking side with concrete walls. The bartenders are super nice and always make me a good drink. 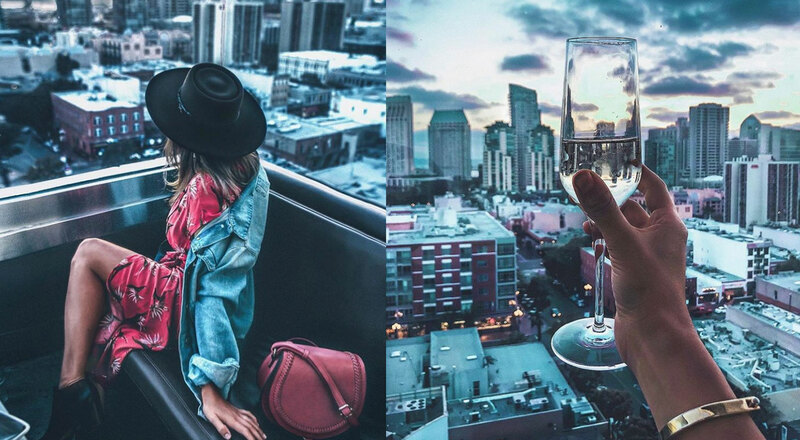 The Nolen Rooftop is the best place to shoot a pretty view of Downtown San Diego! Get there before everyone else does and you may just snag that perfect corner table that has the best angle to shoot the San Diego skyline. Get there right before sunset and you’ve got yourself a killer lifestyle shot. Moniker Coffee is one of my favorite places to work. While it does get a bit packed sometimes, it has adorable decor and decent coffee. Theres a cool black tiled wall, brown leather tufted sofas and tiled floor. The other side of the room is all white with brown tables and has great light as well. What I love is that they also have a craft cocktail bar so after 5 o’clock you can switch from coffee to cocktails. My kinda place. Sunset Cliffs never disappoints. It’s so darn beautiful! You can go for a run around this area while catching the sunset and snap a quick pic or go have a picnic as you watch the sun go down. I love how the colors change as the sun sets here. There are usually a lot of people so if you are planning on doing some outfit shots, just be prepared for some onlookers. It’s a long stretch so just park anywhere you want once you are in the area and walk to the spot you like the most! I hope you guys liked this guide! 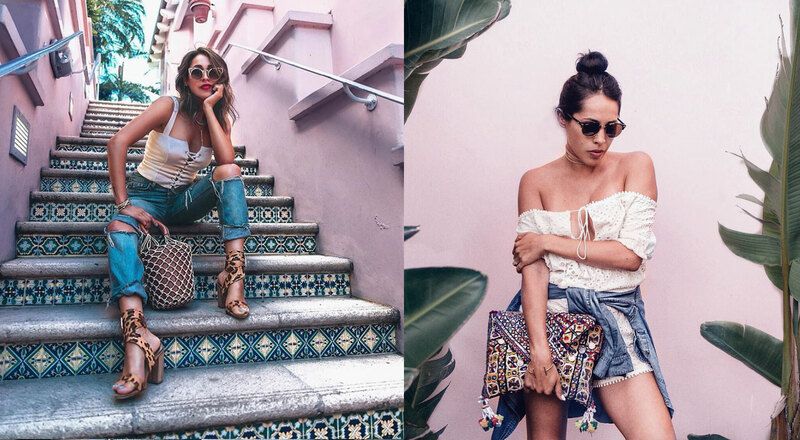 Don’t forget to check out my first post where I share other Instagram-worthy spots HERE. If you have any suggestions of other places to check out or other guides to SD you would like to see, please leave a comment below! Love this post! So helpful for someone who is new to San Diego! Thank you! yes you have to come back! There are so many places. I feel like this list needs to be longer haha! Man I really needed to see this a few weeks ago1 You have the best pictures though 🙂 Enjoy your weekend! ? thank you! Maybe keep it for a future trip! 🙂 Hope your having a good weekend. This is such a helpful list! I know where I’ll be going if I visit SD. I remember seeing Holy Matcha the last time I was there. I thought it was a perfect place to take instagram photos too-its like the shop was designed for photos! yes! Such a cute shop. It’s so insta-worthy. Happy it’s helpful. Thanks so much for reading!